After earning a doctor of veterinary medicine from Washington State University in 1999, she conducted an internship at the Rood and Riddle Equine Hospital in Lexington, Kentucky, in 2000 and completed a surgery residency at Michigan State University in 2003. Dr. Brown was on the faculty at Virginia Tech’s Marion DuPont Scott Equine Medical Center from 2003 to 2010. Dr. Brown has been board-certified in large animal surgery by the American College of Veterinary Surgeons since 2004. Dr. Brown is also very passionate about working and sporting dogs. Having four Labrador Retrievers that are FEMA Certified Urban Search and Rescue dogs as well as competitors in hunting retriever, field trial, and disc competitions really brings it home. Starting her career as an equine surgeon and working on elite equine athletes has brought a unique perspective and skill-set to benefit her canine clients and patients. This is especially true in the use of diagnostic ultrasound, regenerative medicine (stem cell and PRP) and intra-articular therapies in the diagnosis and treatment of canine orthopedic injuries. She became a Certified Canine Rehabilitation Therapist in 2012 and started K-9 Sports Vet, a mobile canine sports medicine and rehabilitation practice. In 2013 she achieved Diplomate status with the American College of Sports Medicine and Rehabilitation. In 2017 she founded the first stand-alone rehabilitation and sports medicine practice in the Tampa Bay area, Florida Veterinary Rehabilitation and Sports Medicine. Courtney has been active in the dog world since starting 4H classes and shows with her family dogs at just 7 years old. After several years competing at local events, she began assisting a professional handler and competed in AKC conformation and junior handling competitions. At age 12, her family rescued a Cattle Dog/Jack Russell mix from a flea market and he introduced her to the world of dog agility. Dash loved to play agility, but multiple health problems kept him from having a competitive career. After several years off, Courtney finally brought home her next agility partners, Frenzy and Banzai. In addition to Frenzy and Banzai, Courtney shares her home with two rescues, Feebs and Gadget, as well as a calico cat named Violet who is in charge of them all. Before joining K-9 Sports Vet and Florida Veterinary Rehabilitation and Sports Medicine Courtney worked at as veterinary assistant at a local general practice. 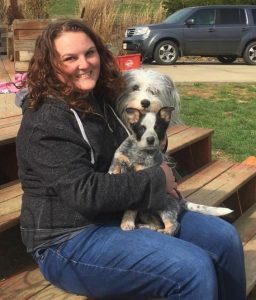 Courtney is currently enrolled in the Certified Canine Fitness Trainer (CCFT) program through the University of Tennessee and hopes to use the knowledge and experience to help our patients in their recovery and conditioning plans.